Whoa. This one is intense. Alice was kidnapped at the age of 10 when she was on a class field trip to the aquarium. She's now lived with Ray for five years, enduring unspeakable things. Ray starves her in an attempt to keep her small and young-looking. He promises her that if she ever tries to run, he will kill her parents. And then he tells her to find him a new girl, a girl that Alice can teach to please him. This book is not for everyone. The faint of heart should turn away now. But man did Elizabeth Scott have me on the edge of my seat. I read this book in one sitting because I just couldn't put it down. It's disturbing, yes. Haunting... check. And also, it's beautifully written. Scott puts you there. I felt like I was watching it all happen (which was doubly disturbing, considering the subject matter). And here's the thing... I had no idea what was going to happen. Right from the beginning, I knew that this was a no-holds-barred kind of book. Alice could be saved or save herself or she could die or (worse) she could not die. She has very little hope, tiny smidgens of opportunity, and I found myself rooting for her vehemently (out loud, alone in my apartment... I'm sure my cats judge me for that). Although the writing is beautiful, the story is not beautiful. It is harsh and ugly and because of that it is utterly real. I'm curious to know what teens will think of this book. Coming to it as an adult (and especially an adult who works with children), I found it profoundly disturbing. Will teens, who are much closer to the protagonist's age, find it as disturbing as I did? I'm thinking that those teens who gobble up those intense, issues books (like, say, maybe Boy Toy or Lucky) will devour this one, too. 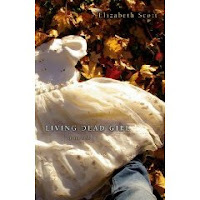 Be sure and read Becky's review, check out Pam B. Cole's interview with Elizabeth Scott, and visit elizabethwrites.com for more info about the author. Many thanks to Elizabeth and to Simon & Schuster for sending me an ARC of this title! Great reviews - I enjoyed reading them all for the last 3 books.